This room is much darker than the others. Must resist the need to nap. Don’t mock, in my estimation, I got up at 4:30 a.m. So Chris was invited to speak at eMetrics on this topic four years ago but didn’t have many solutions to the questions he was asking. Now, he thinks he has a few answers. There will be a prose version of this presentation on SearchEngineWatch, if for some reason you don’t like my coverage. 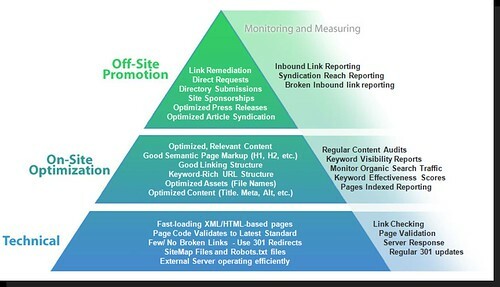 SEO has three areas of focus – Technical, On-site optimzation, off-site promotion. They need to build on each other, starting with a solid technical base. Links become more diverse as you diversify your content. Since SEO has made its way into marketing calendars, savvy marketers have been trying to show more than just “improved rankings”. 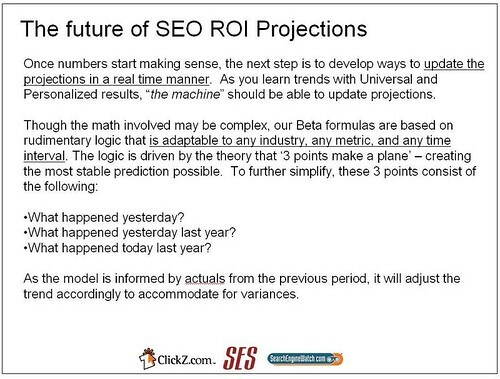 Predicted ROI = (anticipated revenue from SEO efforts) – (Proposed cost of SEO project). Obviously both those elements are hard for SEO because there is no hard and fast rule, for determining that. Are you measuring rankings or are you measuring performance? You have to measure performance. Study: If sponsored listing are not labeled, what percentage of searchers click on Organic listings versus Paid Listing? Who doesn’t click at all? 4.2 million searches – excluding the people who didn’t click at all, 15.8 percent clicked on the sponsored listings. If you include the people who didn’t click anything (35%) then 10% clicked on the sponsored listings. Given three worthy choices, you may choose something based on your passion rather than on the order of the results. That makes clickthrough impossible to predict because you don’t know what the message that will resonate most is. Statistically you can make a guess but in reality, each user has a unique story. The description could influence people differently. If someone was interested in price points and there were prices in the description, that might cause a click. If you like a particular site, that may cause a click. If you want variety, that may cause a different click. 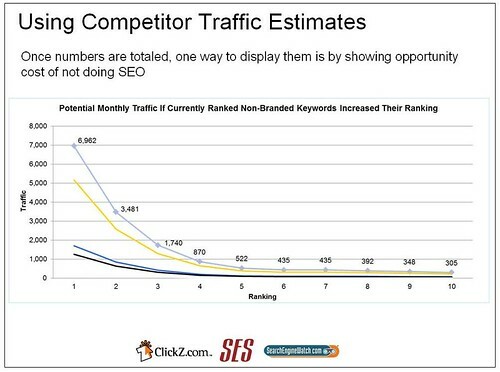 Universal and personalized search make the biggest difference in 2011. Slightly different keywords could return very different looking pages. Additions of News, Shopping, Images. The refinements offered in the navigation may be different. Even if you’re number one, you don’t know what the SERP will look like when the search is done. All of these must be ignored to some degree when you’re projecting results from ROI. How do you do predict traffic and conversion growth? Use multipliers to adjust for the unknown. Limiters and parameters are based on tools and experience. That will tell you what you’ll be able to achieve by what time. Average month by month predictions, to account for seasonality is the best way. More complex doesn’t mean more accurate. It just makes your charts more confusing. If you don’t have history or volume (new sites, niche sites, sites without properly configures analytics, new domains) you can use multiple competitors’ sites to predict how much traffic they get and how much you will be able to get based on that. Look at competitive intelligence tools as relative measuring tools rather than direct competitors. You want to have them graded all against the same baseline. Keep in mind that you may need to use multiple sites, since competition can vary from keyword to keyword. Identify non-brand keywords that competitor sites are ranking for and define a limited set. Multiple that by the search volume. This is a self correcting model in a tool Rosetta has built. This will help you find one-time events that can be filtered out again to continue adjusting. This tool is still in Beta. You’ll never be 100 percent confident in your ROI predictions. There’s a lot of factors involved.